CUTTYHUNK ROSE is a great example of the very-classic Grand Banks 46CL. With the A-list options of galley down, island bed and 375 Cats, Cuttyhunk Rose was sold new by East Coast Yacht Sales in Maine and has spent her life in New England waters under the care of just two owners. Many upgrades and replacements, and ready to go cruising! Please contact listing broker for a link to online pictures: many more than in the listing, and in much better resolution. West Florida Yachts would love to guide you through a personal showing of this 46' Grand Banks 46 Classic 1993. 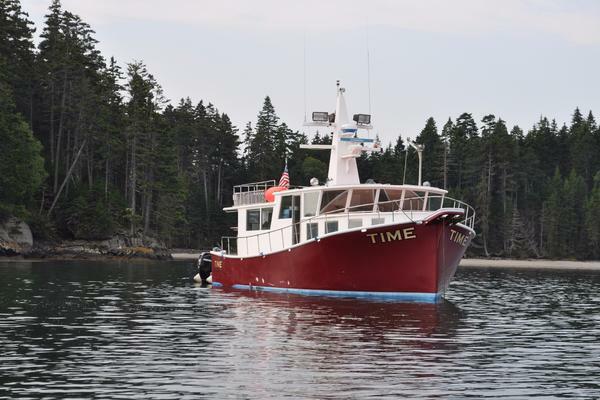 This yacht for sale is located in Unknown, Rhode Island and priced at $269,000. For a showing please contact us by filling out the form on this page and we will get back to you shortly! Grand Banks' classic trawler arrangement: guest cabin with V-berths forward, with private head including stall shower. Stacking washer and dryer in forward cabin locker. The down galley is under forward windshields and provides generous natural lighting. Lower helm is to starboard, with wetbar/icemaker and L-settee behind. Opposite the lower helm is a breakfast bar/nav table, tv locker and seating opposite the L-settee. Aft is the master stateroom with walkaround queen berth, ensuite head/sink and separate stall shower. Three reverse-cycle airconditioning units for heating/cooling throughout. All engine and generator maintenance and oil samples since 2012 performed by DePaul Diesel of Portsmouth RI. Twin Caterpillar 3208TA turbocharged diesel engines, 375hp ea. Approx. 2800 original hours. Three MarineAir reverse-cycle airconditioning/heating systems: forward cabin with 12kbtuh, main cabin with 16kbtuh (compressor replaced), aft cabin with 12kbtuh. Analog instrumentation including tachometers with hourmeters, engine temperatures, oil pressures, transmission pressures, voltmeters. The 46 Classic deck layout features full-width walk-around teak decks. The aft cockpit is two steps down from the side decks and features a step-through door to the swim platform. Flybridge access is by steps to port from the main deck. CUTTYHUNK ROSE features a custom hardtop over the bridge helm, with enclosure.